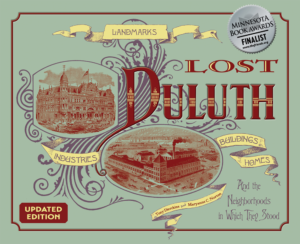 Before the 1880s, Duluth had very few houses that offered more than basic shelter. 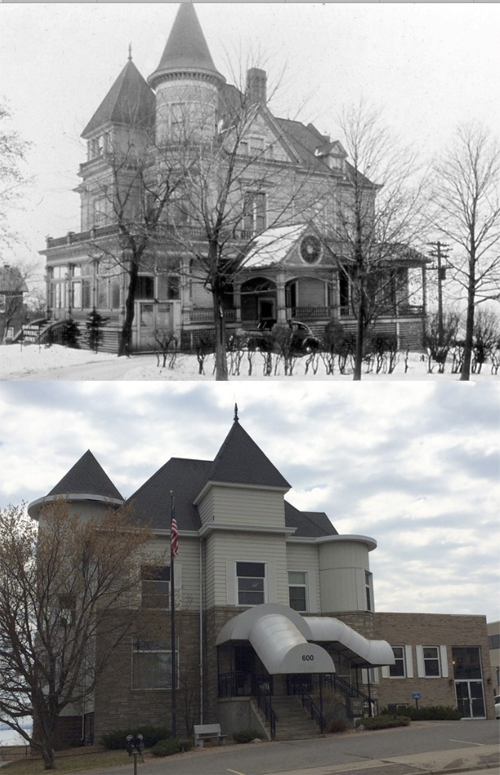 Roger Munger had built a large Italianate house and carriage house at 405 Mesaba Avenue in 1870 and two years later George Sargent built a Second Empire home at what would become 4500 London Road (the property was not even part of a township at the time). The promise of prosperity died in 1873 when Jay Cooke’s fortune dissolved, sending the entire nation—and Duluth in particular—into an economic depression known as the Panic of 1873. The city’s population dropped, and no one in town had the resources to build an opulent dwelling. But Cooke’s investments in Duluth finally paid off when grain from the Red River valley started to flow into Duluth on the railroad Cooke built. That grain continued its journey east on ships loaded in the safety of Duluth’s inner harbor and left the Zenith City through the ship canal Cooke funded in 1870. Duluth became a center for the grain trade, forming its own Board of Trade in 1881. The neighborhood quickly became the center of Duluth’s social and political elite. Residents included Josiah and Rose Ensign (504 East 2nd Street), who came to Duluth from Ashtabula before the canal was dug. Ensign was elected mayor in 1880 and again in 1884, served as the St. Louis County Attorney, and spent thirty-two years as a district court judge. James Ray (403 East 2nd Street) and his son Robert (226 North 4th Avenue East) both built houses in the tiny neighborhood in 1887. The Elder Ray, a native of Massachusetts, lived in Ashtabula before moving to Duluth in 1855. A founder of Portland Township, Ray was instrumental in the digging of the ship canal—which Ensign fought for in the courts during a seven-year legal battle with Wisconsin. Melvin Forbes (530 East 2nd Street) also built a home in Ashtabula Heights that, like many surrounding it, was designed by Oliver Traphagen. Forbes, along with George Spencer and Clinton Markell, organized Duluth’s Board of Trade. Markell—another former resident of Ashtabula—was also a founder of Portland Township and served as Duluth’s second mayor. He waited until 1890 to build his home in Ashtabula Heights at 530 East 2nd Street. In 1907 lumber baron Robert Whiteside and his wife Sophia purchased the Markell house. It was a sign of the times. 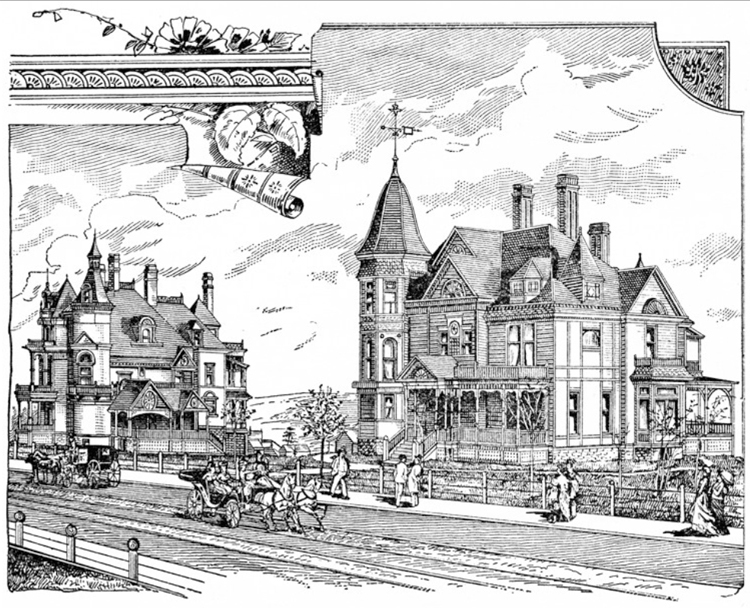 In the early 1890s, development began east of Twentieth Avenue East, where Duluthians who made their fortunes in the 1890s began to build the stately mansions of Duluth’s East End and Hunter’s Park. Developers lured many of Asthabula Heights’ high-profile residents to make their new neighborhoods more attractive to buyers. They even went as far as to offer Duluth’s elite free land or to pay for building materials to prompt them to move. By the 1920s most original residents of Ashtabula Heights had either died, moved back East, or relocated either to Hunter’s Park or the East End. Downtown living and opulent townhouses such as Ashtabula Flats had gone out of fashion as well. Many of the old homes, too expensive for upkeep by individual families, were subdivided into boarding houses. Maintenance was neglected or compromised due to costs. Over the years they lost their architectural integrity and many became all but inhabitable. As St. Mary’s and Miller Memorial hospitals developed and grew, more of these homes were destroyed to make room for the expanding health care campuses. Few Ashtabula Heights homes survive today. The Bell House, once the jewel of Ashtabula Heights, is hardly recognizable today in its current incarnation as the Dougherty Funeral Home, but Salter Terrace at 301–307 East Third Street retains its 19th century charm. Most of what was once Ashtabula Heights is now covered by the footprint of the Essentia Health System.